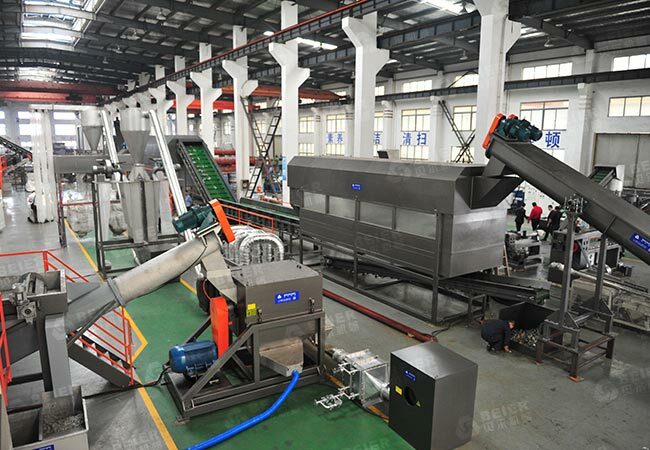 With the large-scale application of plastics, Chinese plastic recycling industry has gradually prospered since the beginning of the 21st century. From the previous family workshop-style recycling plastics model, the pure business model is driven by market demand, and is developing into a recycling processing cluster,market transaction intensification, environmentally friendly industrial economy oriented entirely by market demand and price. In order to meet the needs of the market, Beier Machinery provides a PE film recycling washing line with high production automation and high output. It consists of conveyor belts arranged in sequence by process,a crusher for breaking up a film transmitted by a conveyor belt,a scrubber used to clean the film and to separate the film from impurities on it,a washing machine for the complete separation of impurities from the film,dehydration of the cleaned film,a drying system for further drying of the dehydrated film and a cyclone silo for bagging,the drying system includes a heater, a drying pipe, and a fan set between the heater and the drying pipe to allow the film to enter the drying pipe.Implementation of automation and improvement of production efficiency. 1. Film recycling washing line price is competitive and we take responsibility to any quality uncertainty. 2. Our pursuit of first-rate quality, reasonable prices and comprehensive after sales services offers both potential and long-standing clientele confidence in our company. 3. Plastic Film Recycling machine with?high automation level producton line to reduce cost on labor and increase production. 4. Innovative design of hot washer and washing tank. 5. PLC control, Choose motor brand according to customer’s requirements. 6. We use 304 stainless steel to produce machines which contacting water. 8.High automation level, try best to reduce your cost on labor (especially for three shifts) and ensure high processing capacity: 500-3500kg/hr. 9.Friendly control system (PLC integrated & separated control on each machine) and Touch screen panel, easy for operation, monitor and emergency stop. 10.All parts contacting with plastic material and water are made of high-quality 304 stainless steel; Ensure no second pollution to flakes.